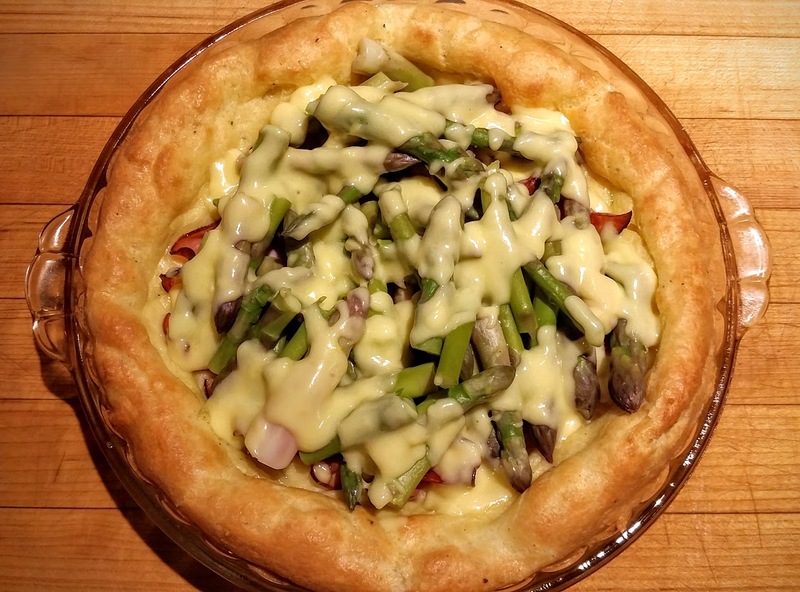 A springtime favorite for garden fresh asparagus, this recipe is a variation on a French Gougère made as a sort-of pie. It’s an excellent brunch. This recipe has been in my family as long as I can remember. We think it might have come from Sunset magazine in the 1970’s, but no one recalls for sure. Whisk together the egg yolks and lemon juice in a stainless steel bowl. Place the bowl over a pot of boiling water. Continue to whisk and add half of the butter cut in 1T pieces. When that butter is mixed in, add the remaining very cold butter in 1T pieces. Continue to whisk until the butter is incorporated into the sauce and the sauce reaches the desired custardy consistency. [It is important that the butter is very cold so it melts slowly; also to not heat the sauce too fast or it will be lemony scrambled egg. In a saucepan, combine the water, butter, salt, and pepper. Bring to a boil. Add flour and cheese. Stir over low heat to combine and form dough. Remove from heat and stir in one egg at a time until well incorporated. Butter a 10” pie pan. Place dough in the pan, making a well in the center, building up the dough around the edges. Lay overlapping slices of ham in the well in the center of the dough. Bake 30 minutes until dough is well browned and fluffy. 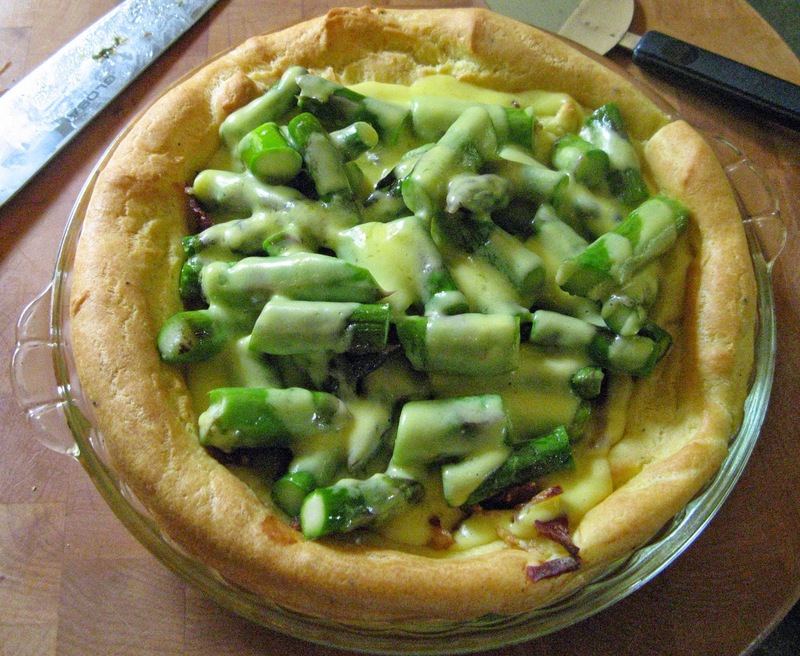 Steam asparagus and place in the middle of the Gougère on top of the ham. Spoon the Hollandaise sauce over the asparagus.